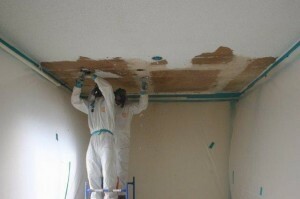 Popcorn ceiling removal in Downey CA makes your property safer and more attractive. In reality, this last point alone is reasonable grounds for a popcorn ceiling removal in Downey CA. Asbestos is a dangerous material to have in your property in any form or location. Why? Because with age or damage, asbestos fibers can get loose from the material and contaminate the indoor air. Exposure to asbestos-contaminated air can cause asbestosis and mesothelioma. When you have asbestos-containing material on the ceiling, any dust that comes loose will automatically drift down into the air you breathe. It is possible for asbestos dust to drift on air currents and contaminate rooms that don’t even have a popcorn ceiling. You can rely on AQHI Inc. to complete a safe and thorough popcorn ceiling removal in Downey CA thanks to our 20 years of experience with this work. We will not only remove all that ugly popcorn texture but also ensure any dust that may be released during work is captured and removed. We will use both wet and dry cleanup methods to clean the floors in the affected areas, and we will also use HEPA filtration to clean the air. Unfortunately, not all asbestos removal contractors are actually qualified to take asbestos waste away for disposal. This can leave you literally holding the bag for the disposal portion of your project. Fortunately, when you choose AQHI Inc. for your popcorn ceiling removal in Downey CA, you get comprehensive service including waste disposal from a certified waste transporter. Expert popcorn ceiling removal in Downey CA is just a phone call away. You reach us at 800-481-8080. Our asbestos removal office for Popcorn Ceiling Removal in Downey CA is open Monday through Friday between 8:00 AM and 5:00 PM and closed for lunch from noon to 1:00 PM. With advance notice, projects can be scheduled for weekends, early mornings and evenings.